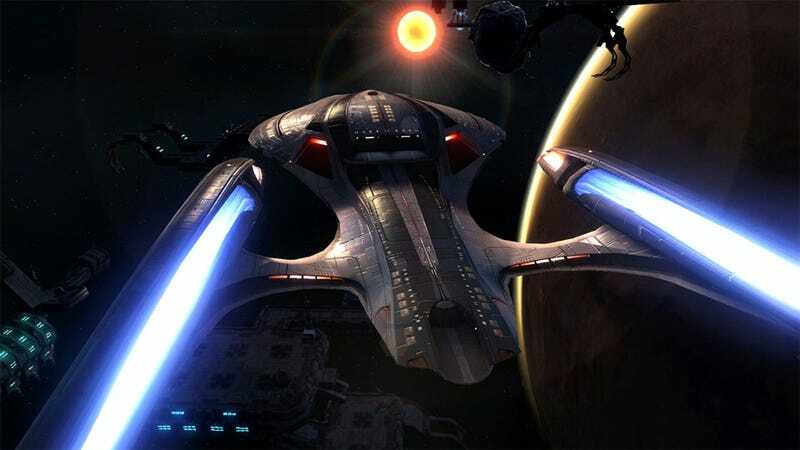 Late last week it was revealed that Cryptic Studios' massively multiplayer Star Trek Online would be going free-to-play later this year, swapping required subscription fees for an active player base. Today we find out what's free and what'll have players reaching for their gold-pressed latinum. The free-to-play model being applied to Star Trek Online really isn't all that restricting to free (silver) players, something that might annoy those that plan of shelling out $14.95 a month for gold status. Free players are limited to two character slots instead of three; 48 inventory and bank slots as opposed to 72 and 96 respectively for paying players; and they won't be able to create new missions using the game's Foundry system, though they'll still be able to play player-created content to their hearts' content. Free players also get limited access to forums, in-game mail, in-game chat, and customer service, are not eligible for priority login or veteran rewards, and have to deal with ad-supported in-game voice chat. It seems restrictive, but looking over the full list it looks like free players will have access to just about everything Star Trek Online has to offer, without having to drop a dime. That should boldly go a long way to repopulating a universe that's steadily declined since launch.